Xiaomi has made plans to overtake Apple in India completely. Last year, the company launched Mi A1 in the collision of the iPhone 7 Plus, while now Xiaomi has launched the Redmi Note 5 Pro in the collision of the iPhone X. The Redmi Note 5 Pro has the same camera module as the iPhone X has. 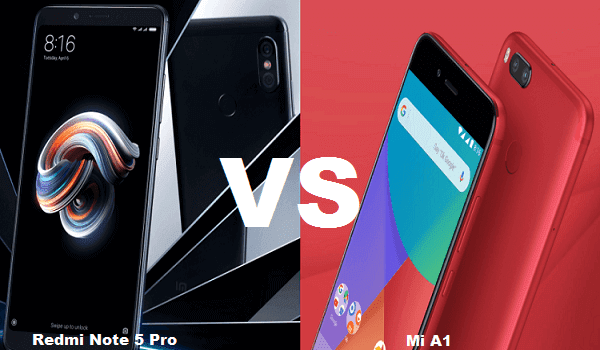 So here the point is that the company has given special importance on the camera of both smartphones, so let's know which smartphone is the best in the Redmi Note 5 Pro and Mi A1? The Redmi Note 5 Pro comes with 4GB RAM + 64GB storage and 6GB RAM + 64GB storage, which is priced at Rs.13,999 and Rs.16,999, respectively. The Xiaomi Mi A1 also comes with the same variant of 4GB RAM and 64GB storage which is priced at Rs 13,999. If you want to buy the Redmi Note 5, then you should buy 4GB RAM variant. If there is 128GB of storage with 6GB RAM, then this variant would be a deal of profit. The Xiaomi Redmi Note 5 Pro has a 12MP + 5MP dual rear camera setup, and on the front, it has a 20 megapixels camera. The Redmi Note 5 Pro has an LED flashlight and has a portrait mode on both cameras. The Xiaomi Mi A1 has a 12MP + 12MP dual rear camera setup, and the front camera has 5 megapixels. The Mi A1 has no flashlight on the front camera. The Xiaomi Redmi Note 5 Pro is the best in case of the camera. Redmi Note 5 Pro has a 5.99-inch 18:9 IPS LCD display with a resolution of 1080x2160 pixels. Whereas, the Xiaomi Mi A1 has a 5.5 inch 16:9 LTPS IPS LCD display with a resolution of 1080x1920 pixels. A Qualcomm's Snapdragon 636 processor powers the Redmi Note 5 Pro and the smartphone is operated by the company's MIUI 9 based on the Android Nougat 7.1.1. Whereas, the Xiaomi Mi A1 is powered by a Qualcomm Snapdragon 625 processor and has the Android One operating system. The device has also got an update of Android Oreo. You will get Face unlock and fingerprint sensor on the Redmi Note 5 Pro smartphones with 4000mAh battery. Whereas the Mi A1 has a 3080mAh battery that supports fast charging and Face unlock feature after the update.